In the early 1990s—years after the passage of Title IX was supposed to guarantee an equal playing field for women student-athletes—the numbers were still not adding up at NCAA headquarters. While student enrollment at most universities was split fairly evenly between the sexes, women made up only 30 percent of all student-athletes on campus. Faced with that reality, the NCAA began a process that culminated in 1994 with the “emerging sports for women” program, an effort to give sports a framework to establish women’s varsity programs by meeting certain benchmarks. Chief among those benchmarks was this: If 40 schools offered institution-backed programs in a particular sport within 10 years, the NCAA would consider taking over that sport’s championships. Many sports have an active club or recreational presence on campus. But for an emerging sport to count as an official varsity program toward that goal of 40, it must meet several criteria, including that it be administered by the university’s athletic department and be reviewed or certified by a staff member designated by the school’s president, chancellor or committee responsible for athletics policy. That can be said as well about the three sports that are currently on the emerging list, awaiting their potential inclusion as official NCAA championship sports: triathlon, rugby and equestrian. Each has taken its own journey to get—and remain—on the list. Each has a different structure and type of organization leading the charge. And each has its own challenges still ahead. Representatives of each effort will be presenting updates to the NCAA membership at the association’s annual convention, January 23–26, in Orlando. Leaders of the efforts for each sport are hoping the information presented will spark more programs to become interested in their sports. Of the three sports on the emerging sports list, triathlon—the relative newbie—began its official NCAA journey in 2014. But in reality, the effort began as far back as 2003 at the office of USA Triathlon in Colorado Springs, Colorado. Building up the club program before pursuing varsity status for programs on campus was key. “If we had failed as a club development program, we would never have gone the NCAA route,” Yount said. One goal of growing the collegiate triathlon space is related to another of the NGB’s missions: developing athletes for the Olympic Games. That goal became more concrete when triathlon joined the Olympic program in 2000. Yount said the NGB looked to the success that USA Swimming and USA Track & Field, in particular, have had at developing elite athletes through strong collegiate programs and saw a potential model. “We needed to create a feeder system program that would help identify more talent for Olympic Games type of athletes,” he said. The rapid growth of varsity triathlon is also the result of a concerted financial commitment that USAT made early in the process. 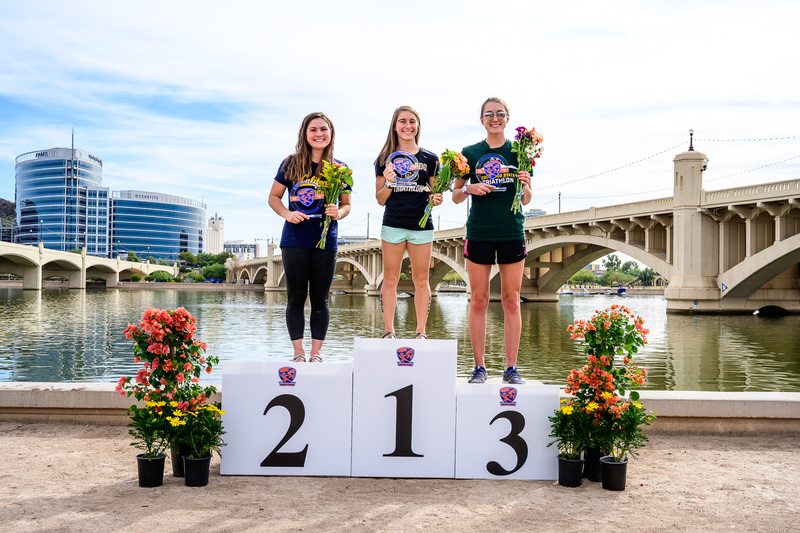 In 2014 the NGB announced a $2.6 million grant program to help universities start triathlon programs, money that can be spent on coaches’ salaries, equipment, travel and other uses. Merrill said that financial support has been key in keeping momentum going for the sport. 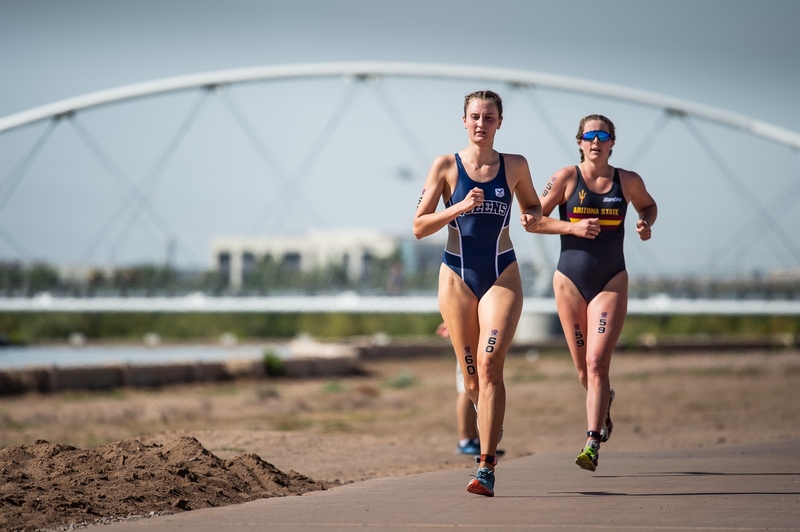 “They are very aggressive, in a positive way, and very involved as an NGB in the funding and the recruitment of institutions who sponsor triathlon—and the messaging of the many benefits of sponsoring triathlon,” Merrill said. While the 26 programs that have joined have been spread across the country, the latest— Hampton University in Hampton, Virginia—became the first HBCU (Historically Black Colleges and Universities) to announce it will launch a varsity program, giving hope that other HBCUs may be interested in joining as well. (Hampton received a $225,000 grant from USAT to launch the program.) Toward that end, the NGB has announced it will plan several initiatives on engaging HBCU schools, including an athlete combine to identify potential talent and a professional development program for students interested in working in the Olympic movement. As for the varsity championship currently administered by USAT, the schedule includes three regional qualifiers as well as the national championship the first week of November. The first such championship event was staged in Clermont, Florida, and the event has also been held in New Orleans and Tempe, Arizona. Yount said that USAT is looking to have host cities even more involved in the event in years to come, to help welcome athletes to their communities, connect with local vendors or identify speakers on topics such as leadership. Another advantage of hosting, at least until the NCAA potentially takes over control of the event, would be the ability to package the collegiate championship around an adult race, adding a bigger footprint to the event week. Such a pairing would also allow those college athletes who didn’t qualify for the championships a chance to compete on the same weekend as those who did. “That’s the impact we can have on communities,” Yount said. While triathlon’s ascent has been quick, the case for rugby has proceeded at a slower pace over the years. But the inclusion of the rugby sevens version of the sport in the Olympic Games in 2016 has brought new life to the effort. As with triathlon, the sport’s national governing body, USA Rugby, is involved in the campaign to reach NCAA championship status. But the bulk of the work has been handed off to the National Intercollegiate Rugby Association, or NIRA, which has also been organizing a collegiate championship in the traditional 15-a-side version of the sport. Rugby has been on the NCAA’s emerging sports list since 2003, but it has been granted extensions to the 10-year limit after showing steady progress over the years. According to the NCAA, there are 19 university programs offering the sport in 2018–2019, including seven each in Divisions I and II. While the NCAA version is the traditional form of the sport, the introduction of the sevens version in the Olympic Games has sparked new interest in the effort, according to Rusert, who is coach of the Air Force rugby team as well as NIRA commissioner. Also helping matters has been a marked increase in participation in rugby nationally, especially at the high school level, she said. 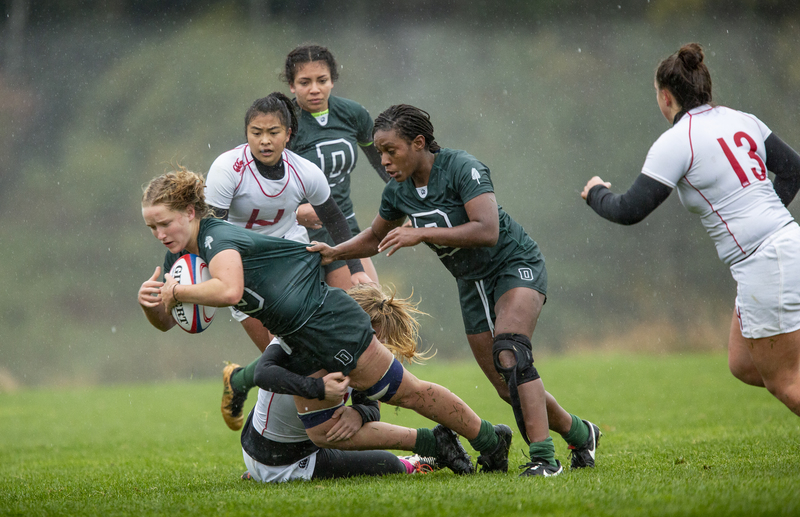 Another positive for rugby as it makes the case to athletic directors is the fact that teams can have 40 to 50 people on a roster, allowing more opportunities for women to participate as student-athletes. NIRA operates two tiers of programs, with neither being division specific. The first tier is for larger or established programs. The second tier is reserved mainly for new programs, smaller institutions or Division III schools. 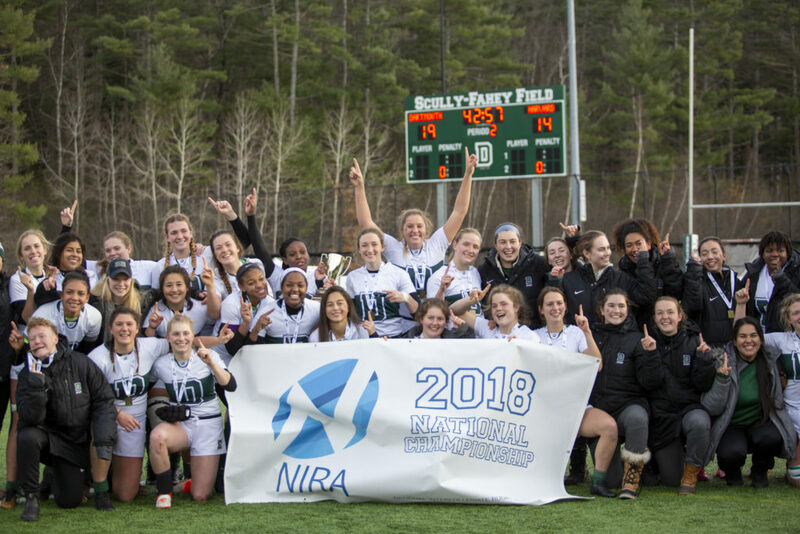 NIRA operates a fall championship (this year hosted and won by Dartmouth) but teams are also able to compete in a collegiate sevens championship maintained by USA Rugby in the spring. Rusert said NIRA prefers to continue endorsing the traditional version of the sport over sevens because it allows more opportunity for participation. “It also addresses a host of body types and athletic skill sets,” she said. New England College will join the varsity ranks in fall 2019, and another Division II program may be announcing a team as well, Rusert said. As for making the case to schools to add more programs, Rusert said NIRA has asked athletic directors with existing programs to evangelize the benefits to their fellow ADs. “If we can equip our administrators within NIRA, they’ll be the best advocates and educators for their peers within the NCAA,” she said. “It’s also our hope that we can see some expansion at the conference level,” noting that two Ivy League schools—Dartmouth and Harvard—faced off in last season’s finals. All of those factors combined give Rusert hope that the sport will eventually emerge from the emerging list. “We hope we’re going to hit a tipping point where we get to that 40, and fast,” she said. 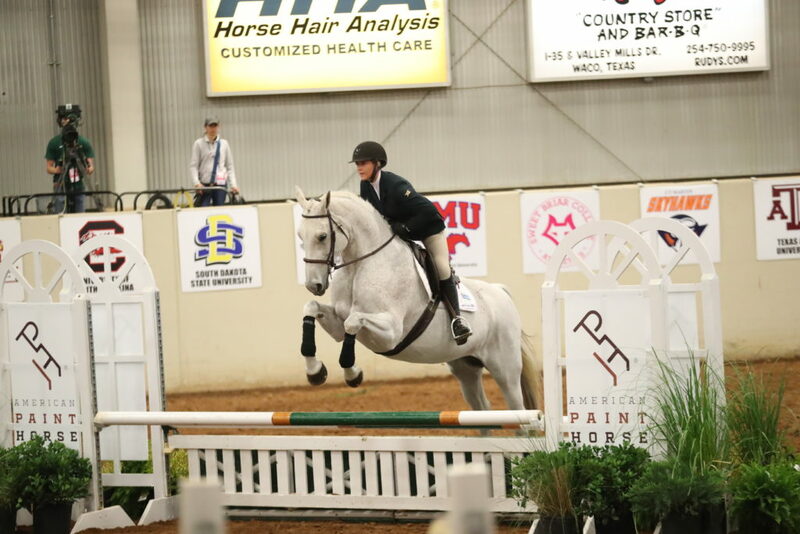 One obvious challenge facing equestrian in its quest to grow the sport is facilities. But universities are figuring out ways to make it work. The sport has been on the emerging list the longest of the three still in the mix, first landing its place in 1999. Slow and steady progress has kept it on the list despite having reached the 10-year threshold long ago. And in 2016 it survived a recommendation by the NCAA’s Committee on Women’s Athletics to remove it from consideration. Currently, the program remains on the emerging list for Division I and II, with 23 schools offering programs. 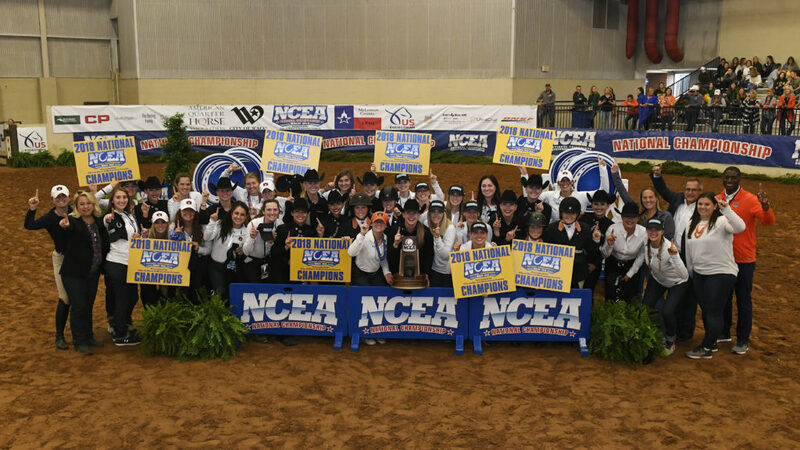 Today, Baylor serves as the host institution for the four-day national championships organized each April by the National Collegiate Equestrian Association, the group authorized by U.S. Equestrian to oversee the varsity efforts with the NCAA. Baylor has hosted the event off-campus since 2006–2007 at the Extraco Events Center in Waco, a venue that has enough practice rings, as well as sufficient seating for the 3,500 people who typically attend. “The facility is very capable and their staff is very willing to assist in any way that we need,” Post said. The venue is set to host the championship through 2020. The partnership with the center has been a good one as the city of Waco determined long ago it could stake a claim as a permanent host of a collegiate championship, not unlike Omaha for NCAA baseball or Oklahoma City for NCAA softball, Post said. Once any of the current sports on the emerging list reach the magic minimum of 40 participating varsity programs, the sport is not necessarily guaranteed championship status. For that to happen, the various NCAA divisions will have to decide if they want to go that route. In many cases, there aren’t 40 programs in a particular division, meaning a sport begins as a championship for any participating programs. If enough programs exist by division, then a championship by division is possible.